Last Wednesday 18th July we were delighted to attend the inaugural susdrain SuDS Awards ceremony at City Hall, London. 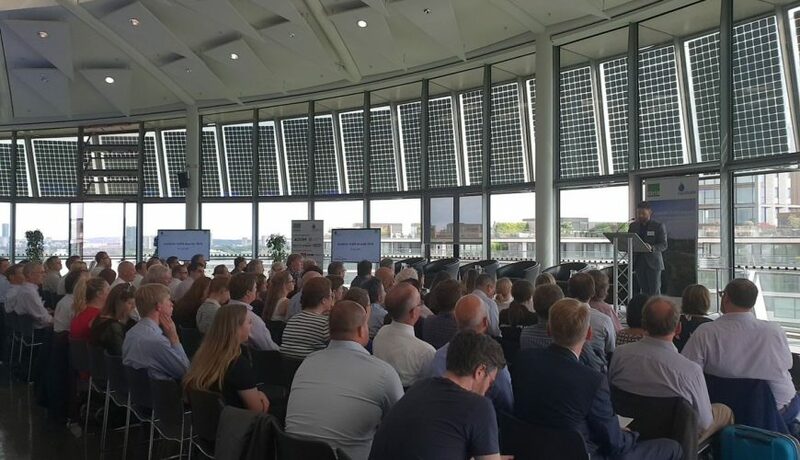 Approximately 100 people attended the ceremony, they were rewarded not only with some magnificent views of London but also a host of awe inspiring SuDS case studies, culminating in the award of a SuDS Champion. In all, 39 case studies were shortlisted and 13 nominees were shortlisted for SuDS Champion. The overall winner was Sheffield City Council for their ‘Grey to Green’ initiative, which showcased a wide range of environmental, social and cost benefits. Chryse Tinsley from Leicester City Council was named SuDS Champion for 2018 having worked tirelessly in promoting, driving and delivering SuDS schemes. Phil Gelder from RAA who sits on the susdrain Project Steering Group said ‘It is clear, at last, that we really are recognising and embracing the benefits that SuDS can bring and are developing and delivering high quality SuDS schemes. Well done to all participants. I am now looking forward to the susdrain SuDS Awards 2019 ceremony when I am sure we will see an even more wide ranging submission of case studies and nominees for SuDS Champion so everyone must start thinking about this now’.